AMMONNEWS - Scientists on Monday unveiled a previously unknown species of giant pterosaur, the first creatures with a backbone to fly under their own power. Neither dino nor bird, pterosaurs -- more commonly known as pterodactyls -- emerged during the late Triassic period more than 200 million years ago and lorded over primeval skies until a massive space rock slammed into Earth, wiping out land-dwelling dinosaurs and most other forms of life more than 65 million years ago. The newly discovered member of the family, identified through remains found in northeastern Utah, had a wing-span of 1.5 meters (five feet) and 112 teeth, including fang-like spikes sticking out near the snout. Caelestiventus hanseni -- roughly, “heavenly wind” -- is probably the most complete skeletal remains of a pterosaurs ever found. 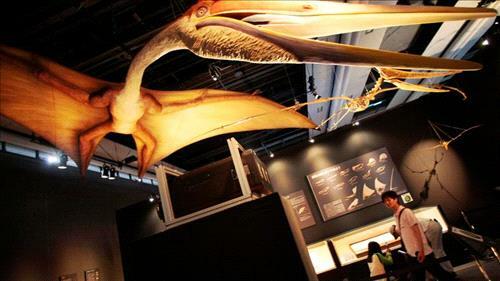 “Most pterosaurs bones look like road-kill,” Britt told AFP, noting that there are only 30-odd specimens in the entire world from the Triassic period. The rocks it was found in were part of an oasis in a two-million square kilometer (775,000 square mile) desert covered with giant sand dunes. “During droughts, large numbers of animals -- including pterosaurs, predatory dinosaurs and crocodylomorphs -- were drawn to the pond in the middle of the oasis, where they died as water dried up,” said Britt. That the high-flying creatures were spread across much of the globe may have helped them survive -- some 201 million years ago -- the end-of-Triassic mass extinction, which wiped out half of the species on land and in the sea.